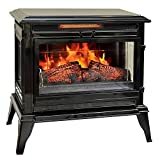 Comfort Smart - CS-25IR-BLK Jackson Infrared Electric Fireplace: Space Heater • The Air Geeks, reviews of air conditioners, dehumidifiers and air purifiers. Comfort Smart’s CS-25IR-BLK – Jackson Infrared Electric Fireplace is one of those space heaters that is pushing the boundaries in terms of design and elegance. With the durable metal stamped body and life-like flame illusions to emulate real burning fire, this space heater promises ambiance and style while keeping you warm during the cold weather. We will tear down these and other features to give you a comprehensive review to help you gauge whether it is a viable choice for you. Without wasting more time, let’s jump straight into its features and see what it has in store for us. A lot was done to give this heater its classic yet modern appeal. Users will not only love the metallic body that feels and looks durable but also the ambiance it offers with its visual intrigues featuring flames and burning embers. Comfort Smart’s CS-25IR-BLK – Jackson Infrared Electric Fireplace bottom features 3 glass windows that enables you to view the flame illusion from all angles to give a realistic wood burning stove. The ember bed and charred logs are said to have been molded from a real thing in order to give it a life-like appearance. The infrared heater is capable of producing enough heat to cover an area of about 1000 square feet with its 4800 BTU capacity. Since the heater vents from the top area, you will have evenly distributed warm air around the room with this heater. This heater is a bit heavy for most users to be able to even lift it from the floor safely. At 34 lbs, you need to be careful while relocating it – dropping it accidentally could lead to broken parts, including the glass windows. Considering there are no caster wheels at the bottom, you will need to ask for assistance while lifting it if you are not sure if you can handle it alone. The heater also requires some real estate of its own in order to work properly. A width of 24 inches and a height of 24.5 inches means that you can’t just place it on narrow passages or under low furniture. The metallic exterior is capable of maintaining cool which is an important safety feature – you won’t burn your hands if you touch it. In addition to this, it also employs overheating detectors that shut off the device in case a defective component overheats which can pose danger especially if you are not around at the time. It can also detect a change in its orientation and will shut itself off if it detects that it has been knocked over. The control panel is hidden behind the stove’s front door and this gives it a real fireplace-like experience as you have to open the door to configure your settings. Alternatively, you can opt to use the remote if you don’t feel like getting up from the comfort of your couch. The heat option only allows you to choose your preferred temperature in 5 degrees increments. This means you can’t set something like 78 degrees as it has to be in multiples of five. The noise level is tolerable and you will be able to watch your TV without hearing the sounds of the fans and the flame noises. You can also comfortably converse with your friend without raising your voice to be heard. This heater comes with a one-year warranty from the day of purchase to give you a piece of mind in case anything works contrary to what you expect. -Powerful infrared -heater warms up to 1,000 Sq. Ft. Elegant design: The metallic design and the virtual flames gives it a classic modern look which is very attractive. I failed to check on the size before ordering and was disappointed with the size however it works perfect for the bathroom and we are very pleased with the unit and ambiance functions. We set the TV on top of itintoand it is perfect for the Jacuzzi tub area." We have used the stove a lot, and it is toasty in our LR. The flames are pretty realistic ambiance and we like looking at it. I was really disappointed when I found out the legs and base were plastic. I think that should be in the description of the product. It's into a and adds to the decor. We like it very much." Comfort Smart’s CS-25IR-BLK – Jackson Infrared Electric Fireplace is a nice appliance to have in your house especially for those who are keen to improve the elegance of their interiors. You are definitely assured to get a quality product when you purchase it. With all that in mind, we hope you have the right information to take the next step and purchase the item if you find that it fits your needs. However, you can always browse our other reviews if you feel this one does not meet your requirements.